Cebek I-5 is a 4 output sequential controller. The 4 relays will be operated one at a time and in a set sequence. They can be activated by a contact or run from the internal clock. The on board clock can be adjusted by the PCB mounted preset potentiometer between 0.3 and 10 seconds. The I-5 module includes the connection for a reset switch, which will return the controller to the first relay. 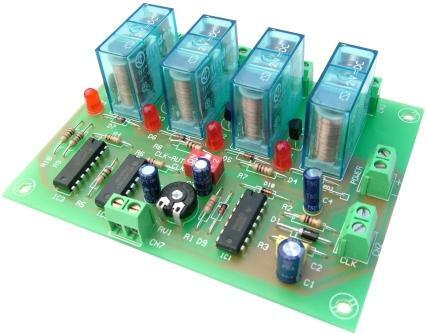 Each relay has an LED to indicate the condition of the output.